Emma had been disappeared. Why? We all use history to suit our purposes, and Emma simply did not suit the purposes of the LDS Church in the years following her husband’s death. It wasn’t just that she was the mother of a boy whom many Saints felt to be Smith’s rightful prophetic heir, rather than Brigham Young. And it wasn’t just that she later helped her son found a rival church, coalescing the support of many former Mormons who had stayed behind in the Midwest. But in fact, it was Mormon polygamy that held Emma back. 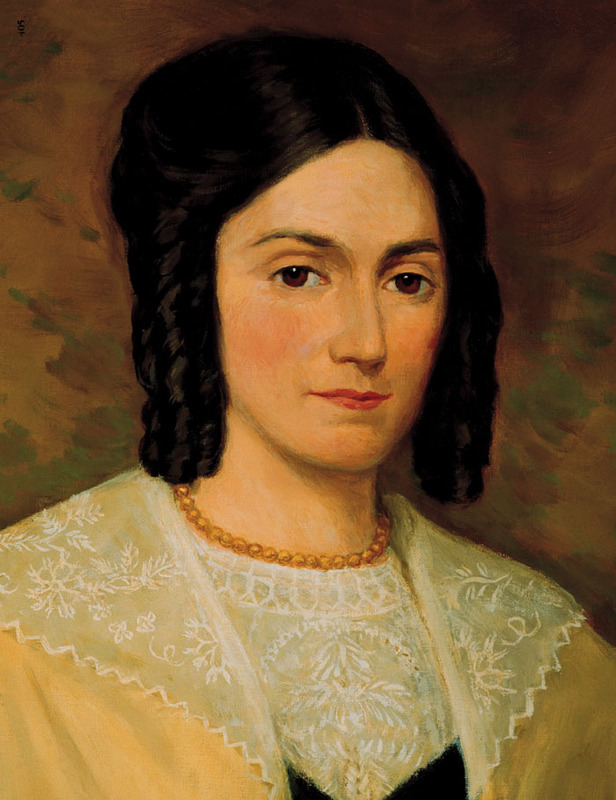 The Mormon Church paints a radiant picture of Emma’s and Joseph’s marriage — he the loving and devoted husband, she the supportive and dedicated wife. While there is every reason to believe Joseph and Emma loved each other deeply, their marriage was filled with turmoil. When Joseph took his first plural wife just six years into his and Emma’s marriage, Emma found the strength to forgive him. This was in about 1833; the young woman was Fanny Alger. Emma did not know, and it was important to Joseph that she not find out. Yet just a few months later Joseph had persuaded Emma that the doctrine of celestial (plural) marriage had been revealed by God. Emma agreed to allow Joseph to marry two young women, Emily and Eliza Partridge. Some weeks later Joseph married another set of sisters, Sarah and Maria Lawrence, wives #24 and #25. But the Smith family began to unravel at the core. Emma may have believed Joseph, or she may have decided to appear to believe him, but the issue of Joseph’s polygamy could not stay dormant in Joseph’s and Emma’s marriage. Joseph sent the sisters away, but tranquility did not reign for long in the Smith household. Not long after this Joseph died, leaving Emma in the company of perhaps another 33 grieving widows. Brigham Young soon took on the mantle of leadership for the Mormon Church and began preparations to take the Mormon people west, away from Nauvoo. The 17-year marriage of Joseph and Emma Smith was punctuated by deception, subterfuge, betrayal, infidelity, threats, suspicion, secrecy and anger. 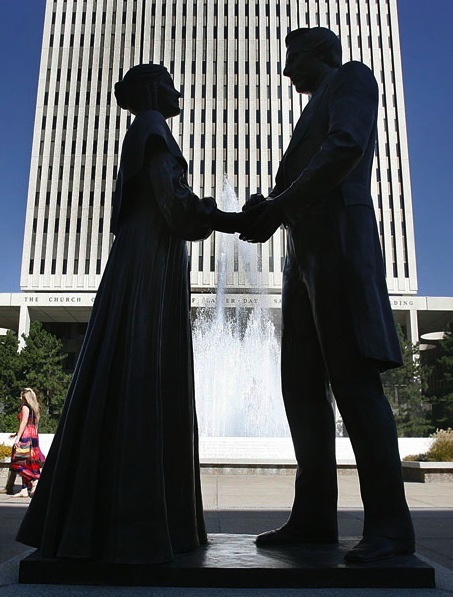 This is not a picture that matches the warm and devoted family life the Mormon Church presents in its reinvention of Emma and Joseph Smith. This entry was posted in Joseph Smith, Mormon History, Polygamy and tagged Emma Smith, Joseph Smith, Plural Marriage, Polygamy. Bookmark the permalink. with all due respect, How would you know how much research I have done? My research is not just about The mormon religion. I attend many different religious services, and not just Christain ones. Research is more than just reading what other people conclude. Maybe go out and see what all the religions have to offer. Or you can continue your obsession with mormonism if thats what you prefer. You know what is really sad about what you said to Falcon is this, Mormons really dont care how much we studied or even know, they are blind and want to stay that way, they really do want to believe what they want to believe. Now you will ask, why do I say that. Here is why I say that. If I went into all the detail I could go in it would take hours or I could write a Book. So it will still be long but it needs to be said. When I was growing up, I was raised as an atheist, not what you might say a practicing atheist, but my family did not believe in religion and I was simply raised by a drunk mother and moral dad. They hated religion and we never spoke about it, so I went about my life doing what I wanted. It really is a story in it’s self about my life before Jesus, and it is so strange that most people would not believe me and what I went through, some people really do think, I make stories up about myself just to sound tough or make people go, wow. I wont talk about it here and it really does not matter. Simply put I have one brother and no sisters, my brother came to Jesus and was saved, he knew the word of God so well he had entire books memorised and entered “contests” in local churchs that hosted contests for scripture memorization. He won lots of awards. He even lead one person that I know of to the Lord. He tried to share Jesus with me and I told him, I want nothing to do with it and if you keep talking to me I will hurt you. After years of my brother sharing with me, or me just wanting to hang out with people I would hang out with his friends. I finally after a lots of things happening in my life cried out to God to say me and I gave my life to the Lord. I shared Jesus with a guy claiming to be a satanist. I shared with JW’s, Muslims, atheists, co-workers, and many other people. But I never meet a Mormon and was never a Mormon. I never knew what a Mormon was and never at this time even meet one. I only heard people mention them here and their saying they have strange beliefs, and they want to have lots of Kids and large families. One day my wife said to me, I am going to visit a friend, care to join me? So I went along, My wife and her friend said they were going to the store and I said I would stay at the house and wait thinking I was home alone. Well their was a knock at the door, I heard someone answer it, say, my moms not home she will be back later. Then this person came into the room I was in. I asked, who was at the door, the Girl said, It was some Mormon Missionaries. Now this time I am talking about was roughly 1996. I thought, I have a verse from the Bible, it was from Revelation and I thought this verse would set them straight and they would leave mormonism. So I ran after them and tried talking with them. I mentioned the verse and they schooled me. I felt like an Idiot, I knew nothing about Mormons. But I really felt like God called me to start sharing with them. Now thats another long story and I wrote about that, so I will provide a link to what I call my testimony and you can read more there. Anyway, I started trying to talk to Mormons to get to know what they believed They were vague and did not really share much. So I went to the library and found the book, Mormonism, shadow or reality and read it from cover to cover. Then I would mention things in the Book to Mormons and they said it was an Anti lds Book and was full of lies. Well I honestly did not know if this was true or not, so I saw in the book on resource was MRM and Bill Mc. So I called him and said, can you send me photo copies of these books and the things mentioned, Like verses from the Lectures of faith, the D and C, J.o.D and other things. He did and I showed these things to Local LDS. They openly ignored everything and said, it’s lies and since I dont have the actual books my photo copies cannot be trusted. So despite the fact I was dirt poor and at this time the Internet was really limited to big computers, found only in Schools and libraries, or rich people, I had to take lots of time and search old used books stores for mormon books, then read them myself. Then after Al Gore Finally invented the internet, I was able to locate more books via online sources. I seriously over years spent 3 or more thousand dollars on LDS publised books, read them and show LDS my book library, They were amazed and jealous. But yet no matter how much I read or how many books I owned LDS really did not care, they were and still to this day, ignore what there past leaders said or taught or they claim we dont study hard enough, or take things out of context. They also claim, these sources are not official, yet quote the same sources to suit there purposes. So J21, to make a really long story short, I have taken years, I would say going on about 17 years of my life studying Mormonism, even went on a two weeks vacation to SLC utah to see, hear and learn. So you LDS can claim we are clueless, but we care more than you will ever know, unless you come to Jesus. I know in my heart, there will be many Mormons that Left Mormonism and JS and followed the True Jesus because of things I said and Did. God gets the Glory not me. Sadly I have over the years, in two churchs I attended and on many websites like this one, have had people tell me I either dont know what I am talking about, both LDS and Non-LDS, or I have had people tell me, my style and approach is all wrong and I cannot say or do the things I say or do. Well I have told those people before, leave me alone and keep your mouth shut, when you spend as much time and money sharing Jesus with people who are lost and headed to eternal damnation and sadly leading people with them, then maybe you can tell me my approach is wrong. But then I have letter with Picture From a Mormon who highly respected me for how I say and do things, and I have many witnesses to that fact also. So as my pastor says, all I have to do is out last my critics, and keep following Jesus. So J21, I dont know about you, but I have put in the time and effort to study what you believe and what Mormons Believe, if you dont believe me, then come to my house and lets talk face to face and you will see, I know more than LDS want to let on, but also I dont know as Much as many here like Grindal or Bill or Aaron or Sharon. But I know enough to make the Devil scared and I am pleasing to the Lord since I am doing as He has called me to do. Further to our discussion about ‘Moses Ethiopian wife’ I was troubled by this one verse in Numbers so I carried out a little research, it would take far too long to type out every little detail so I’ll try to keep it short. The verse that was under discussion & about which I said I was wrong are actually talking, not about a second wife, but about Zipporah. I have done a fair bit of cross-referencing between Exodus & Numbers & as I’m sure you’re aware that these two books cover pretty much the same events. So lets looks at a few of the things to be found in them. In chapter 16 of Exodus we read about the quail being brought to the Israelites, the reason I mention quail is to establish that we’re talking about the same events mentioned in Numbers. In Exodus18: 1-12 of the same book we are told about Jethro bringing Zipporah & her sons to meet Moses. A little fun fact of Mormon history that we don’t hear much about is that there were Mormons getting all sorts of people “sealed” to them to build up their Celestial Kingdom organization. The first Mormon multi-level marketing scheme. There was some real competition for signing up members. The whole point of having multiple wives in the first place was to have all of these brood mares to produce spirit children who would than be available to populate the various planets of the newly minted Mormon men to gods. However the whole thing went a little side-ways when the practice of having other people sealed to a particular man. Mormonism is one continuous re-do, do-over, and remodel. Doesn’t sound like revelation to me. “At this time another ceremony was instituted, which… was significant and important while it lasted. This was the adoption of young men and their wives to one of the leaders. The idea behind it was that in establishing the Kingdom of God upon the earth there should be also a celestial relationship. If the Prophet Joseph were to become a God over a minor planet, he must not only have a large posterity but able assistants of practical skills. Brigham Young had been ‘sealed’ to Joseph under this law; now he in turn had some thirty-eight young men sealed to him. “Of this number, John D. Lee was second…. All of the men thus joined in the covenant seemed brothers in one sense, and for some of them Lee developed a genuine affection. Among others, jealousies grew up as they competed for favor. Let’s face it, these people didn’t have a clue. They were making up a religion as they went along. Anyone who thinks that any of this was by divine revelation, needs to check their Mormon Kool-Aid and see what it was spiked with! I don’t mean to get to far a field here but if Moses had “dark skin” that can mean only one thing. He possessed the “mark of Cain” for not being valiant in the pre-existence. He therefore could not be a priesthood holder and not have a temple recommend. This is really stunning what you have uncovered. Think of it. Moses was not a holder of the priesthood because of his skin color. What then about his brother Aaron? Thanks for the links. I jave started reading some of it but these next two weeks are finals so I may have to hold off for a bit. you must be a very spiritual person to invest that much time and money. I do have to admit that of all the Christians I have come across, including pastors I met with on my mission, I have never seen people this knowlgeable about mormons and religion in general. Honestly, most of my own family members who are christian are ignorant to mormonism. So hats off to y’all ! I’m back to the beginning. Since you are in school, you know that the first thing a person should do when faced with a problem is to formulate a question. The question helps guide the research. Then you do a review of the literature as a first step to see what has been written previously about a topic. Those are the first two steps. Here’s the question that you need to answer. If you get that right, nothing else matters. I’d start with the NT and then take Jesus’ advice after His resurrection where He is recorded in Luke 24:44 telling about who He is. Then pray and ask the Holy Spirit to guide you into understanding who Jesus is. What I said has zero to do with me being spiritual. It all has to do with the truth. When I knew zero about mormonism and Christians told me, this is what Mormons believe and teach, do I just believe them. When I said to a Mormon, I hear this it what you believe, and they sa y to me, thats not true, now whst do I do. I’m told one thing by people I know and trust, but told another thing by the people who should know best about what they believe. Its simple, listen to the people who should know what they belive about there religion. So I buy and read there books, then the problem comes along, Mormon leaders said and taught things that Mormons claim they never really said or taught. Or things have changed. Problems and just believe as they do. Until then, we can study your leaders and prophets all we want, and according to lds we will still know nothing. Despite all the books I bought, read and all the years I have been doing this. I do not use the same arguments and quotes as Jarron. If I had then you would not need to address teh quotes I give or the arguments I make. There is nothing convenient about it, and one has to be selective or the length of things would be ridiculous. The quote you give does not alter what I said, or what that same site says. Yes, Hagar was her property and Sarai could do as she liked. This does not alter the fact that what she did was give Hagar to Abram as a wife, not just to sleep with. She remained the property of Sarai, but was still a legally married wife. Nothing you add contradicts this in anyway. And that is a problem, because I don’t assume they had plural wives. Sorry, there was a typo in my last post, as I meant to say isn’t, but forgot the n’t. I have never assumed anyone had plural wives unless the scriptures have stated that they did. I also have never assumed they didn’t, unless the scriptures have stated that they didn’t. This is my point. You argument is that because it states that some people did that it would mention everyone that did. Where is the logic in this. Those who are mentioned as having plural wives are recounted in the histories of the Bible. There are many prophets who do not appear in these histories. Rather we have only their writings and prophecies, which would be unlikely to give any details as to the prophets history or family life. Even those that are mentioned in the histories are only mentioned in connection to the stories of other people and nothing is said of their personal lives. I maintain that given the lack of direct evidence in the Bible we cannot make any accurate assumption regarding the marriages of most of the prophets. As to your explanation of Numbers 12: 1, I have a few issues with it. First of all, Exodus and Numbers to not recount the same events in any way. They are very different events, and none of the stories even run parallel to each other (except that God gave them quail twice, though each time it was with different results). Thus your chronology doesn’t work. Now, it is true that Zipporah was brought back by Jethro, but to assume that Moses never once talked about his wife and children with his brother and sister seems rather silly. He would have missed them, and they would have been eager to hear what had happened to him since he had left Egypt. Thus to say that they didn’t know about Zipporah, and her nationality, is not logical. Lastly, while Zipporah was not an Israelite, she was descended from Abraham and her father, Jethro, was a High Priest of Midian. Thus the idea of them objecting to that marriage also doesn’t seem very credible. It is much more likely that one descended through Ham would bring such criticism than one descended through Abraham. Also, the way that it is mentioned does not seem to fit this idea either. If it had been Zipporah why not say Zipporah, as we already have a record of her name and family; and why call her an Ethiopian in this one verse, when in every other passage she is definitely identified as a Midianite. While your interpretation may be possible, it is the one that really doesn’t seem that likely. I am still using library internet, so I’m still severely limited as far as keeping up with the conversation. I apologize for interjecting a possibly repeated or heretofore unrepresented topic into the discussion, but it’s mostly relevant. Hopefully some of you are still checking this thread because, if I do say so myself, I think the following is a good point. Anyway, thinking about this article on the reinvention of Emma by the LDS church, I realized that there is something that has not been “restored” with the LDS church – that would be the Church of Christ’s honesty. The Bible constantly reveals the sins, not just transgressions, but sins of the main characters, and not in general terms like the BoM, but in great detail – see David, Peter, etc. The LDS church does not do this with their recent past leaders (JS, BY) or with their current prophet, apostles, and general authorities. Someone could try to argue that the Bible didn’t reveal these sins during the lives of these men so it does not apply to current LDS leadership. But that would be wrong – Paul corrected Peter and it was recorded and distributed by letter(s) in their lifetimes. Imagine if the LDS Prophet and Apostles and GAs actually spoke of their past sins (before conversion- like Paul’s) and present sins (post conversion- like Peter’s)? What would that do to all the pressure to “be perfect” among the membership? What would that do to the concept of “obedience” and “worthiness”? Where would that lead the doctrine and teachings about Grace??? ?